Please note that collection in person is preferred for amphibians - otherwise a courier or reptile taxi can be arranged by the buyer at their own cost. WE WILL NOT POST AMPHIBIANS UNDER ANY CIRCUMSTANCES. From time to time we are able to offer surplus froglets from our breeding amphibians. These will be a minumum of 3 months out of the water and will be feeding on fruit flies or larger prey items. It is strongly recommended that an established vivarium, planted and seeded with micofauna is ready before you purchase froglets. A species, originally from Ecuador and Peru, ideal for the relatively experienced amphibian keeper looking to branch out into poison dart frogs. A hardy species and relatively small (up to 1inch) which breeds easily and can be kept in groups. Eggs and tadpoles also available - please email for availabilty and prices. One of the most popular species available in the dart frog hobby. Naturally found in Surinam this relatively large dart frog is best kept in pairs or male predominated trios. Relatively hardy and a bold species. No froglets available at present. A stunning and large tinctorius morph that is easy to keep, bold and readily breed once sexually mature. As with other tinctorius morphs these are best kept in pairs or male dominated trios. A beautiful thumbnail species ideal for the more experienced dart frog keeper. Relatively bold with a lovely call. Best housed in an aboreal style vivarium planted havily with broad leaved climbing plants and bromeliads. When breeding these frogs can raise tadpoles themselves by laying unfertilised eggs in tadpole deposition sites! A recently discovered (2005) thumbnail species from Peru. As wityh most Ranitomeya species they are particularly suited to heavily planted arboreal style vivarium and appreciate deep leaf litter and microfauna. The original dart frog. It is this species that Columbian tribes used to coat their hunting darts. 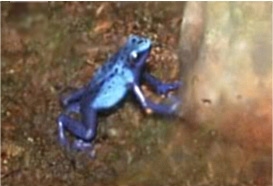 A large and very bold dart frog that can take prey much larger than other species. Does well in groups. Please research well before considering keeping any species. We can provide caresheets for all species offered and a selected number of other species. Please email info@frogsandfood.co.uk for information.